Five days of touring the famous first & second classified châteaux of the Bordeaux wine region accompanied by a wine expert guide, including five nights in a 3 star hotel in the centre of the historic city of Bordeaux. Morning : Pick up at your hotel and transfer by tour bus to the illustrious Medoc wine region. Château Gruaud Larose, St.Julien : visit & tasting. This fascinating 18th century château, owned by the Merlaut family, offers one of the finest views of the Medoc vineyard from the top of it’s turreted tower as well as one of the finest St.Julien wines. Lunch at the “ Pavillon de Margaux” : Situated amidst the vines of Margaux, this elegant & understated restaurant proposes local specialities cooked and presented in original and creative style. During lunch you will be given a brief introduction to the Bordeaux vineyard and an introductory tasting class by your wine guide – a chance to discover the first Medoc ‘garage wine’! Château Margaux, Margaux : visit & tasting. The grace of Margaux’s 19th century architecture (the most beautiful in the Medoc) is reflected in its wines, world famous for their complexity and ‘finesse’. Afternoon : Château Palmer, Margaux : visit & tasting. This 18th century turreted château takes its name from a British general, Charles Palmer. Traditionally considered to be Château Margaux’s ‘little sister’, Palmer has become it’s most consistent rival thanks to the excellence of its wines. Later Transfer from the Medoc back to your hotel. Dinner by your own arrangement. (Your guide will provide you with a list of restaurant recommendations & will make reservations if you wish). Pick up from your hotel & transfer by tour bus to the Medoc. Château Cos d’Estournel, St.Estèphe : visit & tasting : a tribute to Asian architecture, much admired by its original owner, a 19th century spice merchant, this ‘pagoda’ is unique. The visit includes a tour of the beautiful museum where western & eastern cultures meet. Château Mouton Rothschild, Pauillac : visit & tasting : The charismatic Baron Philippe de Rothschild left his impressive legacy of innovation and dedication to excellence here. He always considered making wine to be a creative art – and the Rothschild “Wine in Art” museum at the château is an exquisite demonstration of this association. Lunch at “Le Salamandre” : Enjoy a good selection of fresh fish & traditional Medocain dishes in this friendly ‘bistrot’ style restaurant which overlooks the port of the market town of Pauillac. Château Latour, Pauillac : This mighty , world famous first growth is impressive in every way : from it’s ultramodern vat – room & cellars to the unique quality of it’s wine. Nothing here is left to chance because, if perfection is possible, Latour has made it it’s goal. Château Pichon Longueville Comtesse de Lalande, Pauillac : There is always an exception to the rule, and Pichon ‘La Comtesse’ is one of them. Here you will discover the feminine jewel in the mighty masculine crown of the great Pauillacs. Over the centuries the château and its wine has been modelled by the property's successive lady owners from the Comtesse de Lalande in the 19th century to Mme de Lencquesaing today. Late afternoon Transfer back to your hotel. Morning : Pick up at your hotel & transfer to St.Emilion. Château Beauséjour Bécot, St.Emilion : visit & tasting :The Bécot family have owned this prestigious château for four generations and the beauty of the wine is a tribute to their collective passion and dedication to viticulture. The underground secrets which lie beneath the vineyard are unforgettable…..
Château Figeac, St.Emilion : visit & tasting : Another family-owned château, Figeac is a melting pot of history ; from its Roman namesake, the Consul Figeacus to the present date, this property exudes a mysterious, calm aura which will enchant you. The affable Monsieur Manoncourt, owner of Figeac, who has successfully combined tradition & innovation. Lunch at “L’Envers du Décor”, St.Emilion centre : The most famous wine bar in St.Emilion’s medieaval city centre offers an extensive wine list – by the glass or bottle - and regional specialities in a friendly ‘bistrot ‘ atmosphere. Embark on a fascinating forty-five minute historical tour of St.Emilion (on foot), accompanied by an expert guide and the city will reveal all its secrets, dark and otherwise! Enjoy the chance to taste a variety of wines and obtain valuable advice on the best buys in Bordeaux on an informal tour of the many specialised wine shops in the city. There are also some superb boutiques selling local arts & crafts, tableware & decoration. Morning : Pick up at your hotel & transfer to the Graves region. Château Haut Brion, Pessac-Léognan : visit & tasting : The first recognised estate in Bordeaux to put its name on a wine bottle (1609), Haut Brion is possibly the most famous Bordeaux wine. The sumptuous 16th century property is situated rather surprisingly amidst the sprawling western suburb of the city of Bordeaux. 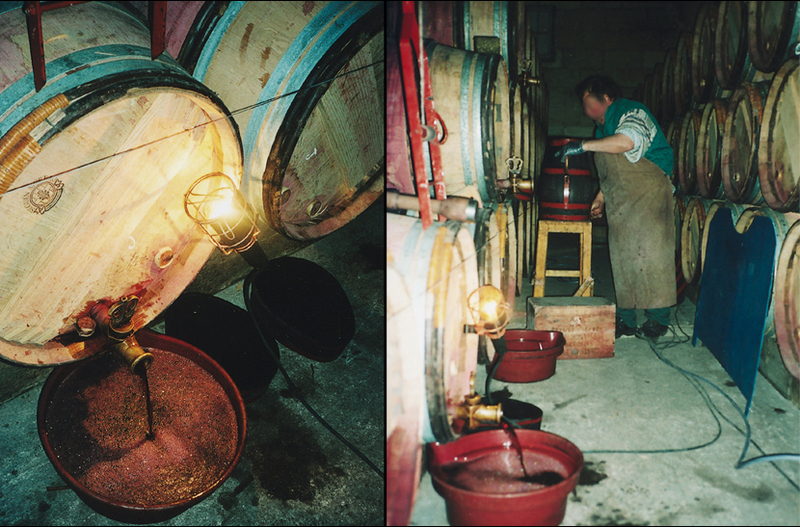 This is one of the rare châteaux to possess it’s own cooperage where you will discover the art of barrel making & ‘toasting’…..
Château Smith Haut Lafitte, Pessac-Léognan : visit & tasting : Florence & Daniel Cathiard who acquired this magnificent property in 1991 are known as the ‘dynamic duo’ : ambition coupled with exquisite taste have transformed both the château & its wines. In addition to the wine facility, they have created the world’s first Vinotherapy Spa complete with luxury hotel & restaurants nestled in beautiful gardens in the heart of the vineyard. Lunch at “La Table du Lavoir” , at the Sources de Caudalie : One of the 2 restaurants in the Vinotherapy complex created by the owners of Château Smith Haut Lafitte, this unique eating place was built from reclaimed tobacco – smoking huts. Here, health-food takes on a new meaning, enhanced the personalised style & creativity of Caudalie chef Franck Salein. Option 1 : Massage & /or a treatment at the Caudalie Vinotherapy Spa : Those of you who wish to be pampered this afternoon may stay at the Sources de Caudalie : enjoy a ‘Wine Barrel Bath’, a ‘Merlot Wrap’, a ‘Sauvignon Massage’ or a ‘Caudalie Grand Facial Treatment’…. ** A taxi can be arranged for your return to Bordeaux afterwards. ** Note : It is important to book the treatments well in advance. This can be done as soon as you confirm the tour by your guide. The treatments & the taxi fare back to Bordeaux are not included in the overall Tour price. Option 1 : Historical bus/walking tour of the city of Bordeaux with an expert tourist office guide. Discover the fascinating history of this ancient city from its Roman ruins, graceful 18th century architecture including the magnificent Opera House, to it’s high – tec tramway system. Depending on the number of people interested, the tour will be either by bus or on foot. Option 2 : Free afternoon in Bordeaux city centre for shopping : your guide will be on hand to advise the best areas. Test your newly acquired tasting skills with a selection of classified growth red wines from the various Bordeaux regions in masked bottles. The winner (the person with the most correct answers) will be rewarded with a prize! Your wine expert will be there to offer advice – but not the answers! Day 5 : Friday: “Aura, Amber & Alchemy” : Sauternes. Pick up at your hotel & transfer to Sauternes. Château de Malle, Sauternes : visit & tasting : A magnificent historical treasure trove, this splendid 17th century château remains a family owned property. The Countess of Bournazel oversees the maintenance of the building, its beautiful Italian-style gardens & the vinification of its superb wines with tender care. A real personalized plunge into the past awaits you here. Lunch at « Le Saprien », Sauternes. The local ‘bistrot’ in the centre of the sleepy town of Sauternes proposes fresh local cuisine in a warm, relaxed atmosphere. Afternoon : Château d’Yquem, Sauternes : visit & tasting : This wine is the ultimate experience : proving that perfection is possible. Every aspect of this flagship château is impressive : from its turreted fortress & commanding view of the surrounding vineyards to its exquisite wine. Yquem is and will always be the king of Sauternes. Later : Transfer back to your hotel. During the journey back to Bordeaux (approx 1 hour), your guide proposes a game of “Baccanales” – a wine aromas quiz. Arrival at your hotel : End of Tour. Dinner &/or departure from Bordeaux by your own arrangement. I am an English wine guide based in Bordeaux since 1988. I studied wine & spirits at the Bordeaux Chamber of Commerce & the School of Oenology at Bordeaux University. I have extensive guide experience in the various wine regions of Bordeaux & a good working relationship with château guides & owners in the area. I provide maps, printed general information packs on the Wine Region, the Bordeaux classifications & tasting techniques and would be happy to offer advice on the best Bordeaux buys. My guide services for the five days are included . When I plan a tour, I always take the personal preferences of my clients into consideration & appreciate as much contact as possible prior to the tour in order to create a tailor-made itinerary. The Bordeaux Tour is the result of my numerous travels & tastings in the Bordeaux vineyard and I have chosen each château carefully : these are, in my humble opinion, the best winery visits in Bordeaux, with something to interest everyone, not just wine lovers but also history buffs, aesthetes and gardeners! Even the most serious wine amateurs will admit this : wine tasting is fascinating and FUN. I hope you will agree and I look forward to sharing the ultimate Bordeaux experience with you. The Transport : Your luxury coach is equipped with air conditioning, reclining seats, refrigerator, microphone, toilet & tables. The experienced chauffeur has a reputation for punctuality & sensible driving! The Châteaux Visits : All visits & tastings will be booked well in advance to avoid disappointment. However, if a visit is not possible at one of the proposed châteaux ( due to restoration work, etc,..) , an excellent alternative will be arranged. Most châteaux impose a visit/tasting fee : this will be included in the overall Tour price. *Transport by tour bus to & from the châteaux & restaurants specified in your itninerary. *Château visit & tasting fees. *Historical visits of St.Emilion & Bordeaux organised by the Tourist Office. 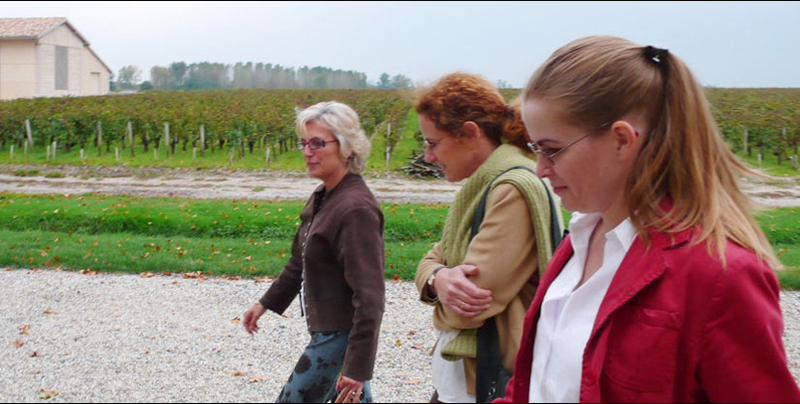 *5 days of guide services of an experienced wine guide. *1 Wine tasting techniques class (1 hour). *1 blind tasting consisting of 6 selected bottles of Bordeaux wines supplied by your wine guide. * Maps & general information packs supplied by your guide. **Extra wine & other beverages & outside breakfast at the hotel. **Treatments &/or massages at the Vinotherapy Spa. **Transport from the airport/train station to & from your hotel.